Every new baby deserves a new blanket....especially if that new baby is my nephew. 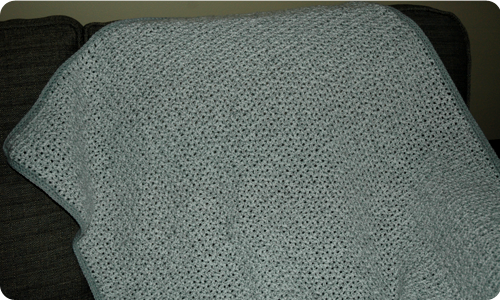 I finished this v-stitch baby throw for him in the nick of time. (The little guy decided to come a few days early so Auntie had to get down to business). Here is a different view. 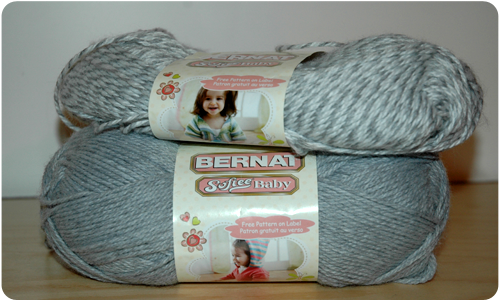 I used Bernat Softee Baby yarn in Baby Grey Marl (twisted grey and white) for the main part of the blanket and Flannel (solid grey) for the border. 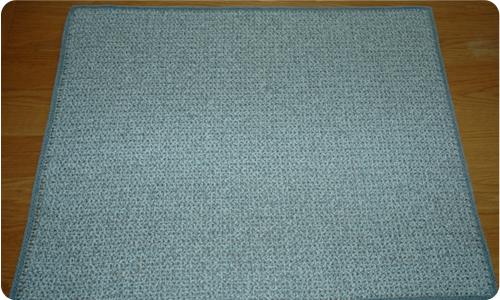 I had planned to make the blanket in blue, but when I was out shopping for yarn I could not find any blues that looked right - I had seen the nursery fabric and without a sample on hand, I knew that matching the correct blue would be difficult. When I spotted the grey, I knew it would be perfect. I was actually a little surprised to see grey as a colour choice in baby yarn, but I love that it is a little non-traditional. I followed Lion Brand Pattern Number: L0238B to make this blanket. It is available for free on the Lion Brand website http://www.lionbrand.com/ The only alteration that I made to the pattern was to use three rows of single crochet for the border, rather than a picot edging. I just thought that a single crochet trimming would look more boyish than a picot. If you have never made a blanket using a v-stitch I would recommend giving it a try. The results are just gorgeous, and it is so simple and quick to finish....though you may still have to hurry in the end if the baby your blanket is intended for comes sooner than expected. Did your mom or grandmother have these hanging in their closet years ago? I know mine sure did. My mom taught my sister and I to make these as kids and I have many wonderful memories of the time spent together working on them. This is just one of the things I love most about crafts - the way that sharing your craft can bring people together and build memories. 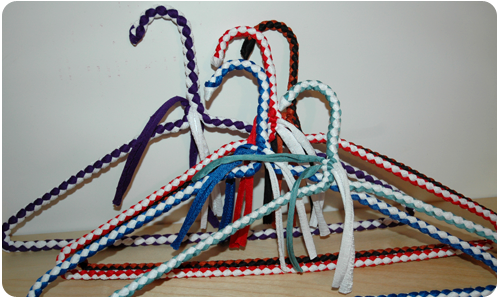 Recently, I got the hankering to make a few covered hangers again. It is amazing that after years of not doing it, I can pick it up and, without even thinking about it, my fingers know where to go. 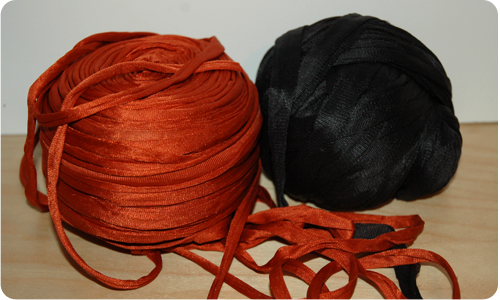 To cover the hangers, I used Qualicraft Nylotex. I am not even sure if Qualicraft Nylotex is still available? I have a huge stash from years ago; the last time I bought some was at Woolco (the predecessor to Walmart in Canada). I picked up wire hangers at the dry cleaners (they are always willing to give me a handful) and used a measuring piece I have saved for years, to measure out my covering material. And after a few hours I had five covered hangers to add to my closet. 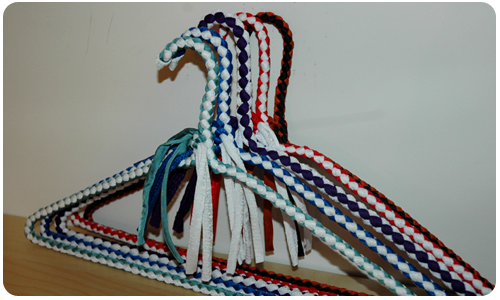 I love making these hangers every once in a while. They are simple and relaxing to work up, and are so pretty when completed. 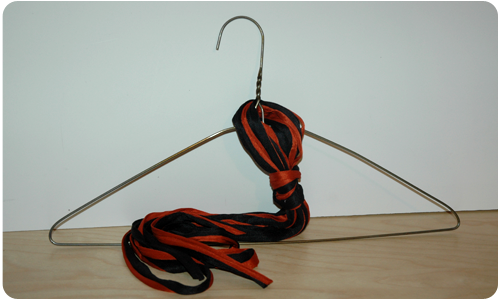 Were these hangers around your home? Do you know if Qualicraft Nylotex is still available? Do you remember shopping at Woolco? 1. They are quick to finish compared to larger projects like a blanket. 2. They are a great way to use leftover yarn. I love them so much! 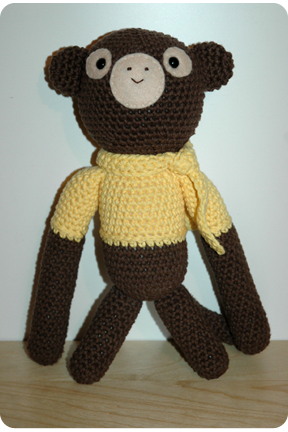 They turned out so well and are by far my favorite toys that I have crocheted (so far, at least). 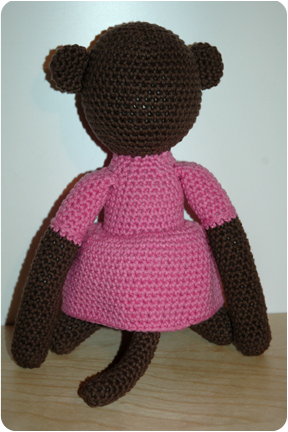 I love the button earrings and the full skirt on the girl monkey. And look at how cute the tail is peeking out from under her skirt at the back. 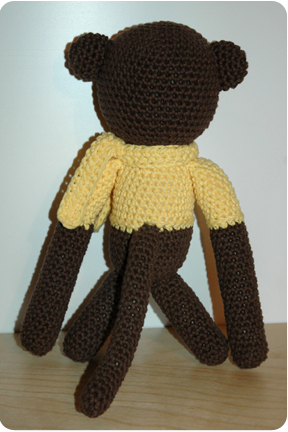 And here is the boy monkey in his coordinating scarf. The boy monkey from behind. 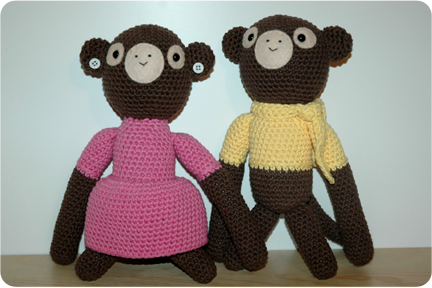 The pattern for these monkeys can be found in the fantastic book "Amigurumi World - Seriously Cute Crochet" by Ana Paula Rimoli. 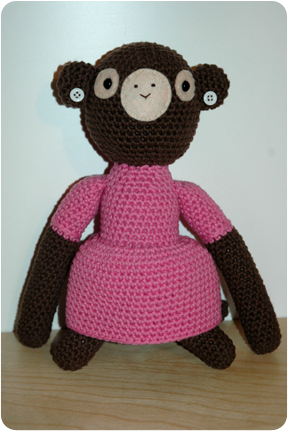 This book is full of adorable critters to crochet; needless to say, there are many more toys that I want to make. I love blogs. 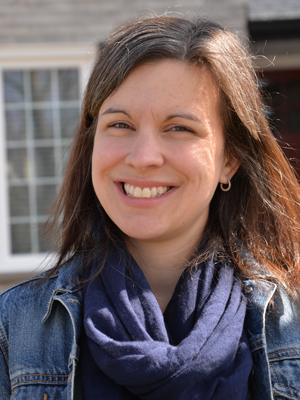 I love the sharing of ideas, the engaging conversations, and the sense of community. I have had my own ideas scribbled in a notebook, and bouncing around my head for some time now. I want to share these ideas and start a conversation of my own.